Home Crew Round Table Podcast Episode 17 - Ontario Organ Donation: Organs for the Rich and Cute first? 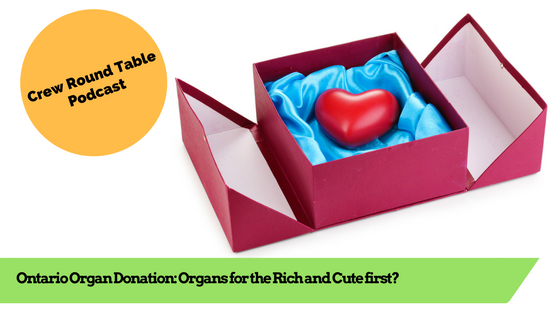 Episode 17 - Ontario Organ Donation: Organs for the Rich and Cute first? There are about 6000 people waiting for organ transplants in Canada, according to Canadian Blood Services. 250-300 people died in recent years while waiting for organs. In Ontario, we have close to 2000 people on waiting lists for organs. Some have taken to private campaigns to find suitable donors outside the official list of those waiting for transplants. In this show we examine the moral and ethical obligations of donating organs, being a “living donor”, respecting family wishes after death, recent high profile organ donation campaigns, and the “cute factor” inherent to all public calls for action. Do you know how to become an organ donor in Ontario? Are you aware of people campaigning for their own organs to “jump the queue”? Should the state make it MANDATORY to harvest your organs upon death?